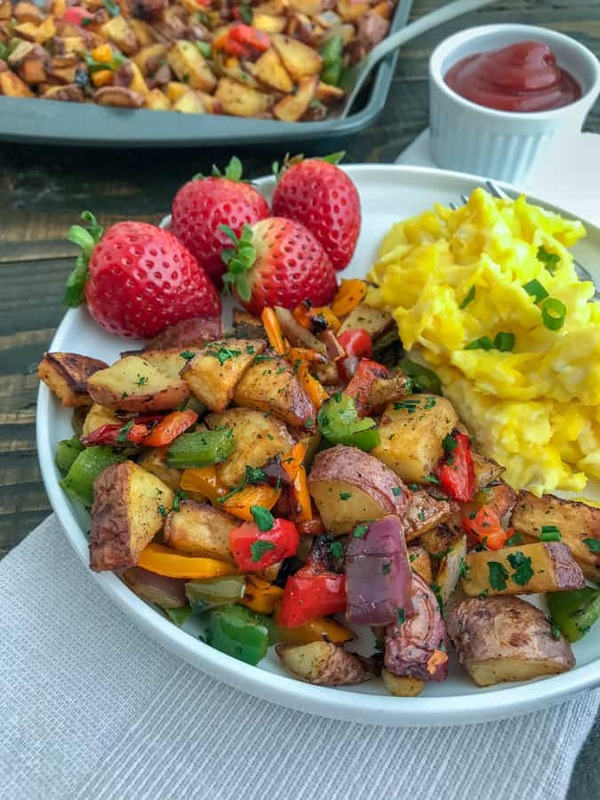 Simplify your breakfast routine with these Easy Sheet Pan Breakfast Potatoes. Cooked to perfection with bell peppers and onions in a delicious combination of olive oil and seasonings! Great for making ahead for meal prep and freezer-friendly. This recipe is Whole30, Gluten-Free, Dairy-Free, and Vegan. We are breakfast lovers in this household. We enjoy a breakfast dish during its traditional time (in the mornings) or at any point of the day, in fact. Anyone else call having breakfast for dinner, “brinner” or is that just us?? Surely not. 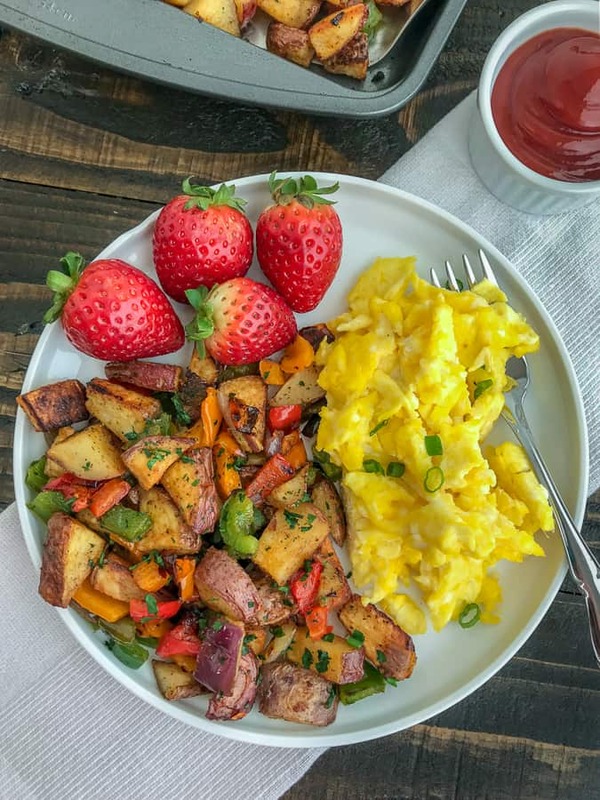 So if you’re a breakfast lover, as well, but hate the hassle and time that it takes to make a side dish like this, then you will love this recipe! 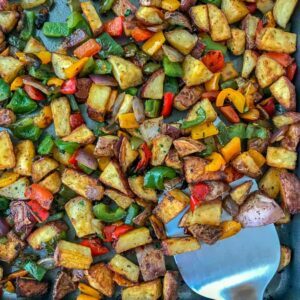 This recipe is the best and easiest way to make and enjoy breakfast potatoes in my honest opinion. To make my busy, hectic life simpler, I find ways to shave not only time, but effort, off of my weekly meal prepping. One way to do that is with Instant Pot Recipes and with Sheet Pan Recipes! For those of you that are into meal prepping, this recipe is a great side dish to any meal. Not just breakfast! Serve with grilled chicken or fish. It reheats well and is freezer-friendly. 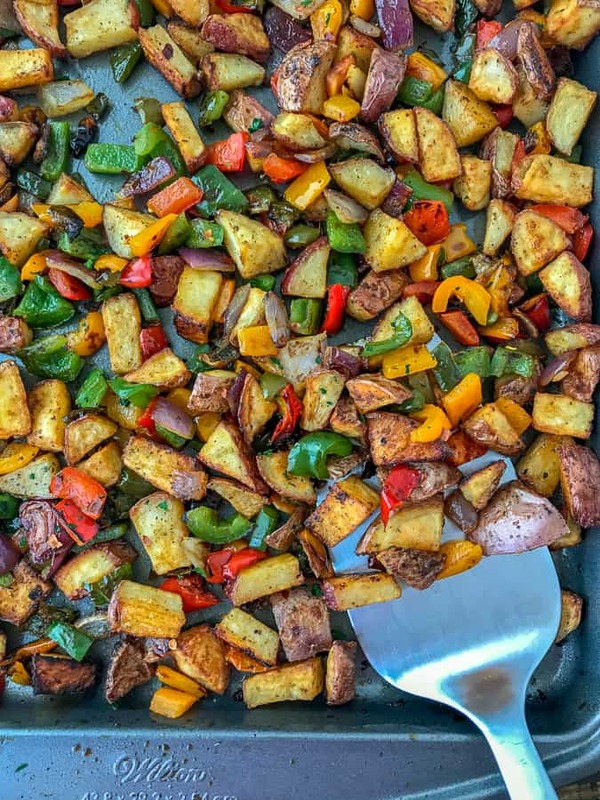 Bite-size potato chunks, bell peppers, and onions – all tossed in olive oil and spices before being roasted in the oven for 40-45 minutes. It’s truly that simple and cannot be messed up – even by the most inexperienced chef! Serve these with eggs, turkey sausage, and a side of fruit for a perfect, well-rounded and traditional breakfast. YUM! Wilton Perfect Results Premium Cookie Sheet – works splendidly and is non-stick! Herb Scissors – a complete game changer when it comes to chopping herbs. I will never go back to a cutting board with my herbs. Extra Large Bamboo Cutting Board – works splendidly for when you need to chop various things. Keep it all on the board until ready to transfer to the sheet pan. Easy peasy! Sheet Pan Lemon Balsamic Chicken and Vegetables – if you’re looking for a super simple, healthy, and quick recipe for tonights dinner – then look no further! This delicious, easy recipe comes together on one sheet pan in 35 minutes or less. Full of flavor, perfect for meal prep and lunches, and guaranteed to be a hit at your dinner table. Mini Garlic Butter Parmesan Hasselback Potatoes – crispy on the outside, flaky on the inside and flavorful throughout. This side dish is very easy to make and comes together in no time! Spinach Dip Stuffed Portobello Pizzas – this incredibly easy and delicious recipe combines two amazing things: spinach dip + pizza! Swap out the pizza dough and stuff a few portobello’s for a healthier, lower-carb, and guilt-free meal! Taco Stuffed Sweet Potatoes – this recipe is incredibly delicious, family-friendly, and easy to make! Clean eating never tasted so good! If you’re looking for a healthy, easy dinner tonight – this is it. VEGETABLES: Keep an eye on the potatoes. They cook more slowly than the vegetables. If you don’t like the vegetables to be thoroughly cooked, I recommend adding them halfway through the roasting time. 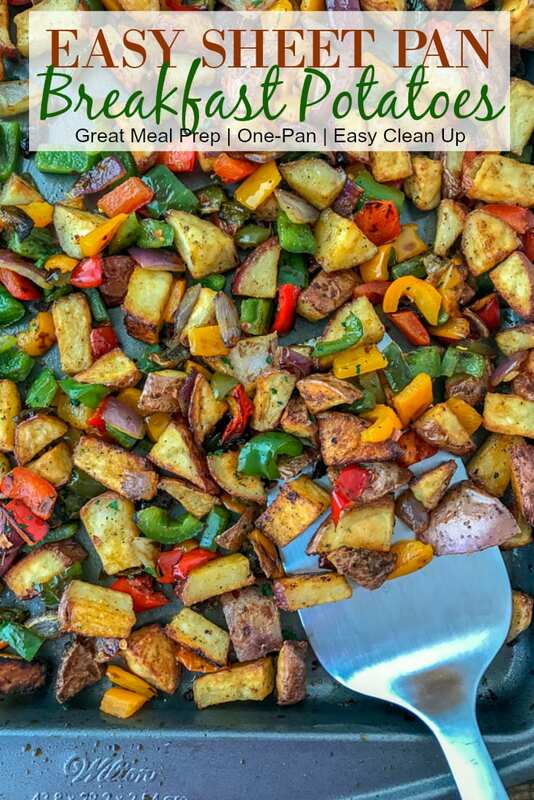 Be sure to stir and flip the potatoes to incorporate the peppers and onions. FREEZING: You can store (cooked) in the freezer for up to 3 months. Be sure to use proper freezer bags or a vacuum sealer to remove any air. When ready to use, remove from freezer to thaw and saute with olive oil or roast in the oven to re-warm as directed in the recipe below. Re-warming times may vary. POTATOES: This recipe calls for red potatoes, but you can use russet or yukon gold potatoes. MIXING: If you’re worried about any potential mess or if it’s easier, toss all of the vegetables into a large mixing bowl with the olive oil and seasonings. Stir/toss to thoroughly coat. Then spread them out onto the baking sheet(s). 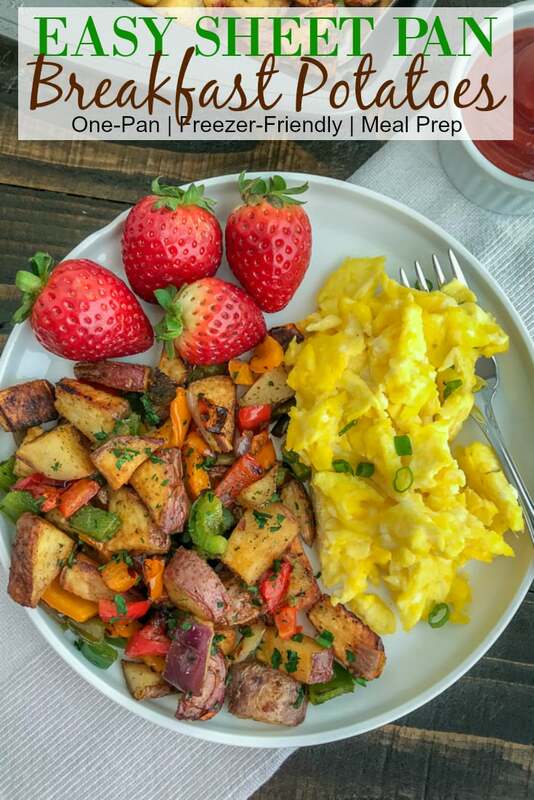 An easy way to make breakfast potatoes with minimal cleanup! Great side dish to any meal, freezer-friendly AND perfect for meal prepping. Preheat the oven to 400 degrees F and line a baking sheet with parchment paper. For extra crispy potatoes, line two baking sheets to spread out the ingredients a bit more. Add all chopped ingredients to the baking sheet(s) in a single, evenly spaced out layer. Drizzle with olive oil and season with garlic powder, onion powder, smoked paprika, salt, and pepper. Stir using a spatula, folding to thoroughly combine. Bake for 40-45 minutes or until the potatoes are cooked through, but not burnt. Stir halfway through baking time, flipping if needed. Sprinkle with additional salt and pepper. Garnish with freshly chopped parsley. Serve hot. VEGETABLES: Keep an eye on the potatoes. They cook more slowly than the vegetables. If you don't like the vegetables to be thoroughly cooked, I recommend adding them halfway through the roasting time. Be sure to stir and flip the potatoes to incorporate the peppers and onions. MIXING: If you're worried about any potential mess or if it's easier, toss all of the vegetables into a large mixing bowl with the olive oil and seasonings. Stir/toss to thoroughly coat. Then spread them out onto the baking sheet(s).